Plan a Staycation... 15 Ideas to Have Fun NEAR Home! You are here: Home / family / Plan a Staycation… 15 Ideas to Have Fun NEAR Home! Plan a Staycation… 15 Ideas to Have Fun NEAR Home! Go Geocaching. Geocaching is a real-world, outdoor treasure hunting game using GPS-enabled devices. Participants navigate to a specific set of GPS coordinates and then attempt to find the geocache (container) hidden at that location. Visit a city park in a neighboring town. Pack a picnic. Visit local or national landmark. Out of over 85,000 places that have been listed on the country’s National Register of Historic Places, only about 2,500 are recognized as National Historic Landmarks. Visit one this summer! Take a nature walk along a local trail. Keep track of special flora and fauna you find. Visit a state park. If you want to extend your visit, go camping, too! Go to the movies. Some local theaters have FREE movies in the summer. Or better yet, see if your area has a drive-in movie theater and make it a PJ and popcorn night for the family. Bike around your city and plan out your stops at parks, restaurants, etc. Make sure to stay hydrated! Have a technology-free weekend. No phones, computers, tablets, or TVs. Come up with ideas as a family of what you want to do together. Have a Family Olympics. Let each member of the family come up with a game or activity and then let the games begin! Hand out silly awards when the games are over. Be a tourist for a day. If you were a tourist in your own town, what places would you visit and things would you do? Make a list and do them! Plan a scavenger hunt around your house, neighborhood, or town. Write up clues that lead to the next place and end with a fun meal or surprise. Travel around the world without leaving home! Have each meal be inspired from a different part of the world and watch a documentary or film about a different country. 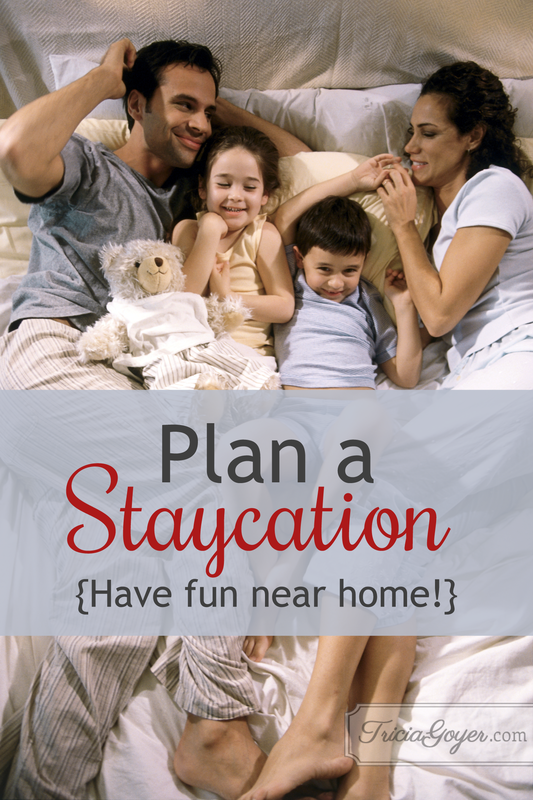 Have you ever had a staycation? If so, what did YOU do?